It doesn’t even look like a park, and that’s what gives Mihama Dai-ichi Park its special character. Mihama Dai-ichi Park has nothing but acres of green grass and open space for visitors to kick back, lay down and watch fleecy clouds drift overhead, feel the breeze and simply unwind. There are no gazebos or barbeque areas, no playground equipment, and no sports facilities. It’s a place for relaxation, both for families and for singles seeking peace and tranquility. Pets are welcome at Mihama Dai-ichi Park. The park has no rest room facilities or parking, leaving visitors with parking on the street nearby. 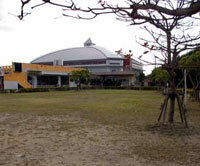 Mihama Dai-ichi Park is easy to reach. Exit the Camp Foster Commissary Gate, turning right onto Highway 58. Travel north until Hamby Town and turn left at signs for Araha Beach. Once at the end of that road, turn right at the traffic light, drive until crossing the bridge, and you’re there.